In this Murky Build Guide, we provide an overview of his strengths, abilities, talents and matchups. Murky is a melee specialist that has the ability to be quickly reborn if he dies, thanks to an Egg he can place down and hatch out of. Not only does this allow him to enter battle quickly (he only suffers a 5 second death penalty) but it allows him to continually push lanes. On Objective based Battlegrounds (such as Towers of Doom or Cursed Hollow) his low cooldowns ensure he can constantly harrass the enemy as they try to cap. I must stress that Murky is incredibly weak against enemy Heroes but is a monster at destroying enemy fortifications and clearing camps. That isn't to say he can't deal good damage, it's simply a case that his tiny health pool ensures he can die very quickly if he's focused. Despite that, Murky is in a much better position than he has been in years thanks to a recent rework. Although I'd still argue that he'll always remain niche, he's much more viable. 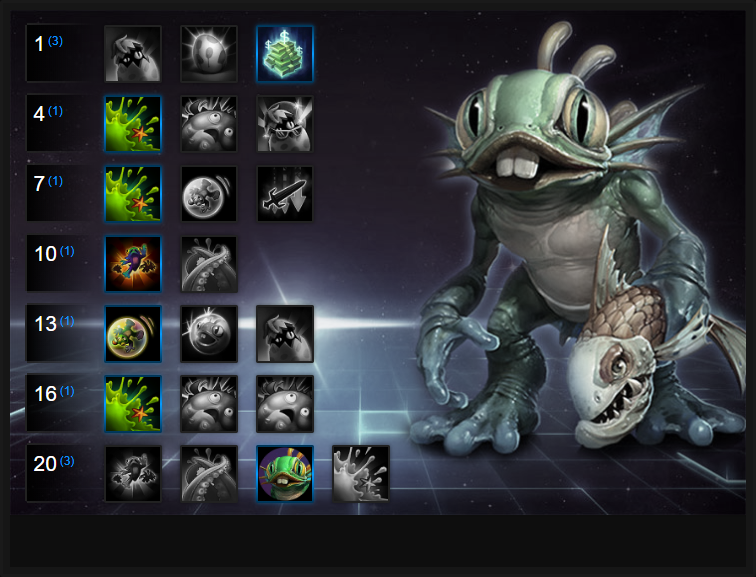 Spawn Egg (Trait) – This trait is what makes Murky one of the more unique Heroes in the game. With only a 5 second death timer, you can constantly be on the Battleground, applying pressure. In addition, you only count for ¼ of a normal death for the other team. Deciding where to place your egg is crucial. You can’t make it obvious, otherwise your opponents will quickly destroy it. At the same time, you can't place it too close to the action or enemy players will quickly sniff your Egg out. Try to hide your Egg in locations not often visited, or far enough away from a fight (such as in a nearby bush) that you can still respawn and rejoin the fight quickly. Slime (Q) – This ability helps wave clear, as well as poke down enemy Heroes.With its low cooldown and long duration, you can feel free to spam this ability, relentlessly pushing waves and threatening Heroes. Don’t underestimate the damage you deal to targets already affected by Slime, as you can effectively force Heroes back. If you can, try to always hit Heroes twice with Slime. The first coats them, the second rewards a massive damage bonus. Should you need to, don't be afraid to use Safety Bubble to buy you time to drop the second. Pufferfish (W) – Pufferfish can be fantastic at quickly pushing down minion waves or zoning the enemy team. In the early game you’ll need to use a Slime or two after throwing Pufferfish in the middle of the wave, but later on Pufferfish can just do the work for you (though this may depend on what Talents you choose.) If you do specialise for more Pufferfish damage, you can throw the ability in the minion wave, and immediately go somewhere else while still getting the experience. Regardless of which talents you choose (though I'd recommend below) always try to ensure Pufferfish detonates. Safety Bubble (E) – Murky might be very squishy, but he does have the fallback of Safety Bubble’s invulnerability. It’s important to be careful about when you choose to use this ability, due to its relatively long cooldown. Make sure you’re getting off at least a couple abilities in lane before using the Bubble, to get the most use out of it. If needed, also use to it to escape or to double-slime an enemy Hero even if it means you die afterwards. March of the Murlocs (Heroic) – If you’re looking to apply a lot of pressure on a lane or during a team fight (or your enemies have a habit of fighting grouped up out in the open), March of the Murlocs can deal significant damage, while also applying a lengthy slow. Just be aware of the reduced damage to structures, as this can impact how quickly you’re able to push the lane. Octo-Grab (Heroic) – This Heroic is part of a simple, but effective combo. Throw a Pufferfish at an enemy Hero, then immediately Octo-Grab them to ensure that they’re hit by the fish. This is unlikely to instantly kill a full health opponent, but can be devastating when you have follow-up from one or two team members to quickly take out a priority target. While it can make you vulnerable, the full 3 second stun will still apply even if Murky doesn’t stay alive for its duration. Best of all, late game your Pufferfish automatically applies a Slime for maximum burst. Bribe is pretty insane for Murky (and will likely be nerfed in the next few days). Killing any minion with Pufferfish allows Murky to gain a stack of Bribe. 8 stacks allows him to Bribe a camp. Unsurprisingly it's incredible for lane push and allows him to constantly pressure the enemy team and their lanes. Variable: Murky relies massively on his Egg positioning and the reason why he should constantly move it is to ensure that he can quickly get back into a fight. Fish Eye not only grants greater vision from his Egg (+200%) but it also allows Murky to locate Stealthed enemies. The main reason to take Fish Eye however is that when exiting your Egg, Murky gains a 45% movement speed buff that lasts 5 seconds. This ensures you can be back into a fight in seconds, but also allows Murky to place his Egg that little further afield to protect it and still make it quickly onto lane or an objective. Slime Time is a Quest that has two parts. When Murky uses Slime against 15 enemy Heroes he gains an increased damage bonus of 125 (which is huge). Not only that, when he Slimes thirty it increases his slow amount to 30% (from 25%). It's fairly easy to complete the Quest and the additional damage/utility is awesome. Providing much wider coverage for Murky's Slime (+30%) Black Lagoon offers amazing AOE pressure when in lanes and team fights. Its larger radius also means you don't quite have to get as close to enemy players to hit them. Variable: Slippery When Wet increases Murky's Safety Bubble movement speed by 40% but also allows him to move through enemy Heroes. Not only is this amazing for escape (when needed) but fantastic for avoiding damage and chasing down enemy players. When you want to mitigate incoming damage before following up with more abilities (such as a double Slime) it's invaluable. Incredible wave push, amazing for bringing down structures and pretty bloody good in team fights. March of the Murlocs is amazing for Murky. Rejuvenating Bubble, your Safety Bubble now becomes ridiculously strong as it replenishes 40% of your maximum health across its duration. It’s pretty much guaranteed to bring you up to full health and when combined with your movement speed, puts you in a strong position to escape easily or to re-engage and attack once it ends. Every 3rd basic attack you do sees you cast a free Slime on them. You can then instantly follow up with your own Slime for huge burst damage. Toxic Buildup is brilliant. Variable: When you cast Pufferfish it cast Slime upon landing, but allows you to then instantly follow up with Slime. It's a huge amount of burst before the Pufferfish has even detonated. Fish Oil is a must. Big Tuna Kahuna is amazing for gaining greater survivability. With double your default health and Egg respawn time, you can be even more of a nuisance. It allows you to become incredibly tough to bring down. Variable: Allowing Murky to channel his Heroic, Never-Ending Murlocs can spawn them indefinitely as long as he remains stationary or unharmed. If you can find a bush, or vent and have your team fight in front of you, it's amazing how much pressure you can cause. Hero matchups are a little different with Murky and all honesty, there’s very little value in me providing you with a list of who you’re strong or weak against. Going toe to toe with another Hero will pretty much guarantee your death unless that Hero is on 1 health or you've Octo-grab available. Almost every single Hero in the game can kill you in a single rotation of their skills. Heroes such as Nova can kill you instantly at level 20 if you don’t Safety Bubble fast enough while most of the Assassins can quickly do the same. My best advice is to simply avoid them unless in a large team fight and stick to lane rotation to destroy towers. You can comfortably harrass a lot of enemy Heroes - that isn't in question - but your ability to kill them relies solely on them being terrible, or grabbing them with an upgraded Octo-Grab + Pufferfish. Situational and not something you can use constantly. This list of tips and tricks are just a handful of things we think will help your Murky play. We'll continue to add to the list as required and if you have any tips you'd like to share, let us know in the comments below and we'll place them here. 1. Always push multiple lanes. You're amazing at taking down enemy minions so wipe them, let yours do the work and move to another lane. 2. As long as your Egg is alive, dying means very little to Murky. Just make sure you hide your Egg well. 3. You don't have to hide your Egg in the base, you can put it anywhere. If you want to play aggresively, hide it somewhere on the front lines. 4. Your Safety Bubble not only provides invulnerability but if you follow this build path, also offers a heal and speed boost. You can use it defensively or aggresively. 5. Try to use your Puffer Fish against stunned enemies or large groups of minions. 6. If you really want wave push, March of the Murlocs is amazing at taking down enemy structures (even with its reduced damage), especially if you use your Puffer Fish at the same time. 7. If your Egg dies, an exclamation mark will appear over your head. This means you are visible to all enemies on the map. Run away! 8. Even though you can quickly get back into battle if you die, it doesn't mean you should waste your lives. Try to still pick your target and instantly harrass them with Slime. 9. Remember that you're almost guaranteed to die against most Heroes if Safety Bubble isn't on cooldown. Try to fight them alongside others while harrassing lanes. 10. Don't worry if your first few games go badly. Murky is a tough Hero to master and understand. Get practicing in Quick Match. 11. Pufferfish once upgraded casts Slime instantly. Follow up with your own Slime for instant AOE burst damage. 12. Murky excels on Objective interaction Battlegrounds.